I love angel food cake. It is one of my favorite desserts, especially in the summer. Topping it with fresh berries and a dollop of whip cream is a sweet dessert with less guilt. Sure buying a box of angel food cake mix, adding water to it and giving it a quick mix is easy but making it from scratch is just as easy and nothing beats homemade. As much as I love using fresh lemons, and I always have lemons on hand, for this recipe I use lemon extract. Lemon juice can be to watery so you don’t want to substitute lemon juice for extract. Plus the lemon extract is much stronger and really helps with the true lemon flavor of this heavenly cake. I do incorporate some lemon zest into the cake and glaze to give little flecks of fresh lemon in the mix. If you follow me on Facebook I mentioned last weekend that I was making this for a picnic. What I also love to do if I am serving this to guests when entertaining is to soak berries in Limoncello. How about that for a topping? For the Limoncello topping what you just need to do is cut up the berries you would like to use. I typically use a mix of strawberries and blueberries. Pour some limoncello over the fruit, as much or as little as you want and let the berries take a bath for the day. The longer they soak, the more they will absorb the Limoncello. If I am serving this for dessert I will typically make this in the morning for that evening. It is so good! 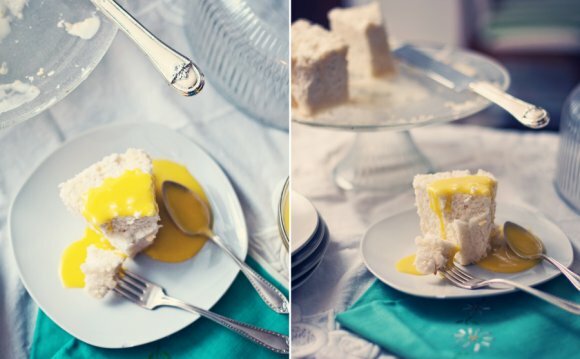 This angel food cake is light but it is bursting with fresh lemon flavor. There is something about this version I simply love. It is a refreshing dessert you can sit and enjoy while watching the sunset after a long day. Using a stand mixer or electric mixer with whisk attachment add to a large bowl egg white, lemon extract, cream of tartar, vanilla extract, salt and lemon zest. Stir on medium high speed until stiff peaks form, about 4-5 minutes. Reduce speed and gradually add in sugar until just combined. Gradually sprinkle in cake flour and by hand fold into mixture a little at a time. Don't over mix. Pour batter into a 9 or 10 inch angel food tube pan and bake for 35- 40 minutes until top is golden brown and springs back when touched. In a small bowl combine confectioners sugar. Add a little lemon juice and stir until consistency is desired. Stir in lemon zest and drizzle over cooled angel food cake.